The causes of drug abuse is very complex due to the interaction between the factors associated with individuals, environmental factors and the availability of substances (drugs) factors. 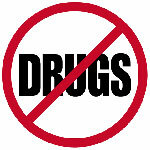 There is no cause (cause) in the case of drug abuse. Environmental factors include factors of family and social environment, both in the home, school, peers and society. 2. Often late to school grounds asleep. 3. Often late for class after recess. 4. Often, dream and they slept in the school. 5. Often forget to schedule repeats, forgot to take the book's text. 6. Decline in school performance (see after 6 months of drug use). 7. Have difficulty concentrating and memory decline (see after 6 months of drug use). 8. The lack of attention to the cleanliness of the clothing and the appearance (but before it is not the case). 10. Changes in sleep patterns were observed (difficulty waking up in the morning and at night often complain of difficulty sleeping). 11. Often caught the reddened eyes and nasal flow (although the disease is not influenza). 12. Often do not pay school fees (the money is reported as disappeared). 13. Frequent loss of valuables at home.